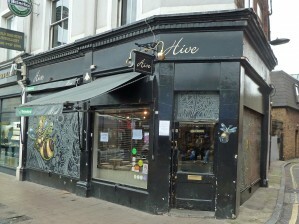 This is a small restaurant near the recreation centre which has been a long term fixture in Brixton in various guises. Its current incarnation is as a bar upstairs (not visited) and a restaurant on the ground floor. The restaurant is cosy, although the position of the table leg requires three or four people to negotiate how to sit in relative comfort. We didn’t book on this Thursday night but we arrived relatively early – just after 7.00 – and within half an hour it was full and many people popping their head round the door who had to find sustenance elsewhere. The food is simple.. There is a menu and almost as many things on the specials list on the wall. There are also a variety of different ways of eating – tapas, “boards to share” as well as the usual starters and main course. Being traditional we went for main courses and chose a burger, beef pie and greens and crispy pork belly and extra chips with a starter of mixed olives. The olives were not a great start which is a great shame as there is a Portuguese delicatessen just round the corner that provides some of the best olives in London. Our main course were much better. The piping hot beef pie came with a spoon as well as a knife and fork. The beef was soft and the gravy unctuous and the spoon was definitely required. The pork was as described – tasty and crispy and the chips were flavoured slightly with garlic and even though we didn’t need them we were glad we did. The only problems were the burger which was described as a bit boring (probably in comparison to Honest Burger). No-one asked how to cook it but it seemed ok and not too overdone. The greens were just that different kinds of cabbage. The problem with that is although steamed some parts need more cooking than others so the darker cabbage was a little chewy. It was £15.00 per person inclduing wine and beer and so very reasonable for the quality of the food. You can eat much cheaper as at the beginning of the wek they have specials. The cheap dates section (e.g. 4 tapas and a bottle of wine for £10.00) all seem very good value. The bar has music nights but we didn’t explore that. We thought we would visit again especially as the weather will certain deter us from sitting in Brixton Village and then we do intend to order the cocktails.